Cinema Paradiso Methven is a boutique cinema located near Mt Hutt, twenty five minutes from Ashburton. We are one of the smallest cinemas in New Zealand able to offer the latest blockbuster movies. Open five days a week, we are licensed so you can enjoy a glass of wine or a beer with your movies, and we offer soft drinks, popcorn and lollies. Click on the below movie posters to view screening times and to make a booking. You can also watch the movie trailer and view detailed information about the movie including ratings, genre, consumer advice, length, and cast. Click on movie posters for screening times, to make a booking, watch the trailer, and view movie information. Bookings can be made by phoning 03 302 1957, or made through this website – click on the movie you want to watch and fill out the booking form on that page. If you make a booking on the phone please leave a contact phone number so we can ring you back to confirm your booking. Car parking is available on Main Street and in behind the cinema, with rear door access to the building complex. Gift vouchers are available from Cinema Paradiso. Cinema Paradiso is open five days a week, Wednesday to Sunday. Love movies? Join the Methven Movie Club; regular movie nights for anyone who would like to come along. If you are looking for somewhere special to hold your social club outing, fundraiser, private party or children’s birthday party, give us a call! Need a screening room for your conference? – power point available here. Please enter your details below to join our email newsletter. Can we please reserve 4 tickets for Avengers movie for tonight? 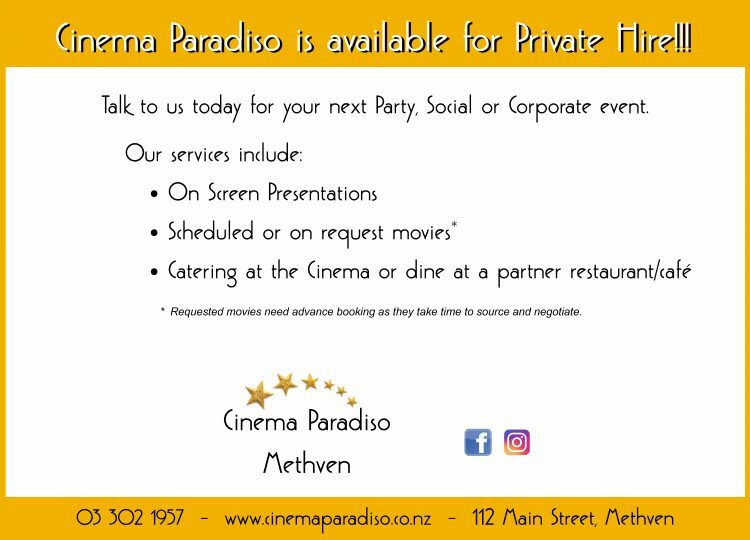 Cinema Paradiso - Methven updated their cover photo. Cinema Paradiso - Methven shared a post. Michelle Morgan Roderick Thorn reckon we all need a night out! !